New Phyrexia is the third set in the Scars of Mirrodin block. The set features 175 black-bordered cards, including randomly inserted premium versions of all cards in the set. 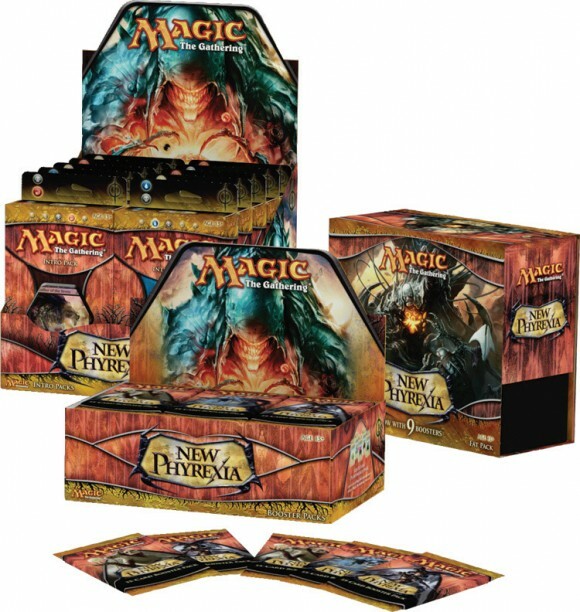 The set introduces new mechanics including phyrexian mana. 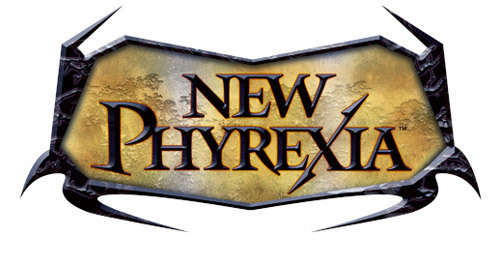 New Phyrexia concludes the story that began in Scars of Mirrodin, with the Phyrexians defeating the Mirrans and taking control of the plane of Mirrodin. Like the cards in the two sets before it, the cards of New Phyrexia are watermarked with either faction’s symbol, but the ratio of Phyrexian to Mirran cards significantly favors Phyrexia. This showcases the progress of the Phyrexian invasion and is a reversal from the ratio as it was seen in Scars of Mirrodin. In a similar fashion, the Phyrexian keyword mechanics of Infect and Proliferate spread into colors that did not get cards with these mechanics before. Just like Mirrodin Besieged before it, New Phyrexia features a cycle of basic lands, used to showcase through the artwork the transformation of Mirrodin’s landscape during the Phyrexian take-over. The promotional card given to participants at the Prerelease tournaments was Sheoldred, Whispering One, one of the five powerful Phyrexian praetors. The launch party promotional card was Phyrexian Metamorph, and the Magic Game Day promotional card was Priest of Urabrask. New Phyrexia introduces five new mana symbols, referred to as “Phyrexian mana.” These symbols resemble a mark of Phyrexia on a colored background, one for each color of mana, and indicate a cost that can be paid with either 2 life or one mana of the respective color. This mechanic also heralds the return of colored artifacts, previously seen in Future Sight and the Esper shard from Alara block. The keyword mechanics Infect, Proliferate, Living weapon, Metalcraft and Imprint return. Karn gets a Planeswalker card, the first colorless planeswalker card that has, up to that point, the largest amount of loyalty counters added by a planeswalker’s first ability with +4, and the most costly ultimate ability at -14 loyalty counters. The set has a small subtheme of “splicers”, 1/1 creatures that put a certain number of 3/3 Golem artifact creature tokens onto the battlefield and grant abilities to them. Another small subtheme was nicknamed the “blood tax,” and referred to spells such as Vapor Snag which resembled other utility cards (in this case, Unsummon), but with an additional rider that caused a loss of 1 life. The rules term “poisoned” introduced in Mirrodin Besieged returns. A player is poisoned if they have any poison counters. 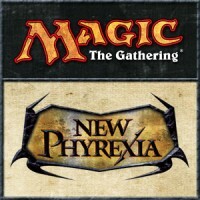 Add a Review for "Magic: The Gathering – New Phyrexia"